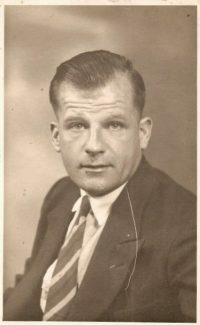 Leslie Claxton was the brother of Allan Claxton of the Claxton Furniture shops on Canvey and Benfleet. This picture has come from his granddaughter Cathy in the USA. Cathy’s mother was Leslie’s daughter Lesley. The Claxton family of which there were several children, were born in Wales, their father was William Alfred and their mother was Mary Ann, who were born in Suffolk and Essex respectively. On the 24th December 1939 at St Katherine’s Church, Canvey, Leslie Gordon Claxton married Violet Ann Aldridge, the daughter of William Aldridge, a builder on Canvey from the 20’s to about 1940. On his marriage certificate Leslie stated he lived at Station Stores, South Benfleet and that he was a driver. Was he driving for the Claxton furniture/removal company? During those years the Aldridge family lived or had the building business on Canvey at ‘Greengate’, in Heldon Road (1929 Electoral Roll), ‘Prospect’ in the High Street (1933 Kelly’s Directory) and ‘Cromwell’ in Long Road (1939 Leslie and Violet’s Marriage cert). Lesley died in 1989 aged 76. You can see the Claxton family in Allan Claxton’s films. If anyone can add any information to the Claxton or Aldridge family regarding their time at Benfleet or Canvey please comment below. Cathy is waiting to hear from you. Hi, I’m Pauline Claxton, now Ashworth. Leslie Claxton was my dad’s brother. Name Leonard Claxton, married to my mother, Edna May. They had 11 children, 6 boys, 5 girls. Lived at Tarpots. Very happy family. I met my uncle Leslie a few times. He was a nice brother to my dad. Also knew my auntie Millie. I liked her a lot. I never met the rest of the family and would have loved to have met them. Grandparents are buried at Benfleet near the station. Hope I get some sort of reply, Pauline. Canvey’s Archive now have a more detailed history of the Claxton family of Canvey and Benfleet. Can anyone say when this photograph was taken? Ronald Baker's Yard, Benfleet Creek.